Almost 80% of American adults will suffer low back pain at some point. Interestingly, 70-80% of low back pain is associated with musculoskeletal imbalances and improper core activation during everyday movement. Join us as we take a look at the latest research on the biomechanics of low back pain. From the hip to the foot, you will be surprised by how many different imbalances attribute to low back pain. Help your clients get their bodies back in balance and move pain free! Current FLS online members log in to subscribe. 5 year subscription includes future course revisions. Successful completion of the quiz is necessary to receive Continuing Education Credit. New members register to subscribe. 5 year subscription includes future course revisions. Discuss low back pain facts and the important role the fitness professional plays in educating, rehabilitating and enhancing function in clients with low back pain. Describe how the spine is an integral part of the lower extremity and discuss the concept of kinematic compensations. Identify and discus bone anatomy including the vertebral column, spine, intervertebral disks, disk herniation, the pelvis, and the sacroiliac joint. Identify 3 local muscles and 6 global muscles related to low back function. Discuss the effect of imbalance on the function of these muscles. Describe 3 planes of movement and 3 axes of rotation. Identify 5 kinds of forces/factors acting on the spine. Explain how to perform 3 low back assessments and identify stretches that can be used to improve dysfunction. Describe the three areas of bones in the foot, 3 joints in the foot/ankle, and discuss the role the foot plays in back health and function. Describe how the 3 foot types are related to low back pain. Identify 2 common enhanced spinal curves and discuss how they are related to low back pain. Discuss the 3 main contributing causes of low back pain and proper posture. Identify the 3 factors that should be included in a low back corrective exercise program and explain how to apply corrective measures including strengthening and stretching appropriate muscle groups. 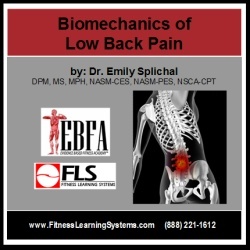 Review three case studies and discuss how to identify the cause of low back pain, determine if the cause of low back pain is associated with foot dysfunction, and elements of a corrective fitness program for that client. Note 1. This course is approved for Continuing Education credit by NASM and AFAA as part of the Specialist Certificate Program above. In order to receive NASM and/or AFAA credit you must complete the entire Specilist Certificate Program. Please click on the Specialist Certificate Program link above for CE Credit information. Copyright © 2019 Fitness Learning Systems Inc.